Portland's Crystal Springs Rhododendron Garden. Portland, Oregon can be a little chilly and a little rainy. While these characteristics can sometimes make it gloomy and somewhat unpleasant to be outside, they are also key in making Portland’s outdoor attractions green and beautiful. Visitors to Portland will want to visit some of these outdoor gems, and people traveling with their furry companions will be happy to learn that many of Portland’s outdoor attractions are dog friendly. Here are five of our favorite dog friendly outdoor attractions from our visit to Portland. Henry and Charlie would rather be watching ducks than getting their picture taken. 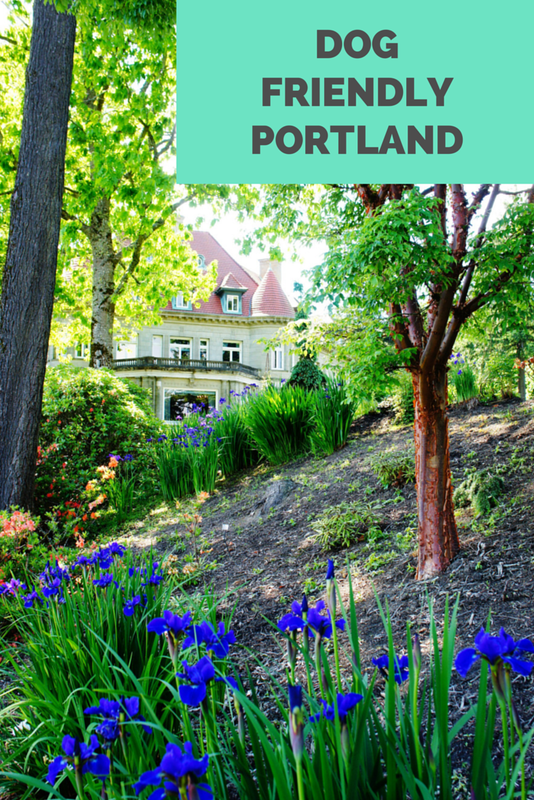 The Crystal Springs Rhododendron Garden is probably the farthest out from downtown Portland of our list of five dog friendly outdoor attractions, but it is also the most stunning. Crystal Springs Rhododendron Garden is about a 10-minute drive southeast of Portland across the Willamette River. The property was originally owned by William S. Ladd, mayor of Portland, in the 1800s. The oldest surviving rhododendron in the garden dates back to 1917. The idea for the garden was started in 1950 by the Portland Chapter of the American Rhododendron Society, and the garden was officially named in 1964. Entrance into the Crystal Springs Rhododendron Garden. The Crystal Springs Rhododendron Garden is surprisingly large and filled with brightly colored rhododendrons, azaleas, and other plants. The gardens are riddled with paths winding through the landscape and along Crystal Springs Lake, which surrounds part of the garden. The abundance of open water also attracts birds including ducks and Canada geese. Some of the bright rhododendron. You don’t have to be a botanist to enjoy these beautiful gardens for a couple hours, and photographers will be in heaven with the varied landscapes and abundance of flowers and birds. Dogs have a great time walking the paths and spying on ducks. You can even find baby ducklings at the Crystal Springs Rhododendron Garden. The Crystal Springs Rhododendron Garden is open daily throughout the year. Admission is charged between 10:00 a.m. to 6:00 p.m. Wednesday through Sunday from March through Labor Day. Admission is free at all other times. Visit the website for up to date hours and admission fees. The Pittock Mansion was the home of Henry Pittock, a newspaper man, and his wife Georgiana from 1914 to 1919. The mansion remained a family residence until 1958 and was purchased by the City of Portland in 1964 to be preserved as a community landmark. The interior of the mansion, with its exquisite curved architecture, period pieces, and newfangled features such as a central vacuum system and intercoms, is open to visitors. Because of Pittock’s love and commitment to Oregon, he employed Oregon craftsmen and used Northwest materials to build the mansion. While the interior of the mansion is not dog friendly, the surrounding grounds and hiking trails are. If visiting the Pittock Mansion on a cool day, park the car in the shade for the dogs and take the 30 to 60 minute self-guided tour of the mansion. Then grab the dogs and explore the 46 acres of gardens and hiking trails. The mansion is on a hill above Portland, providing views of the city and, on a clear day, views of Mt. Hood in the distance. Visit the Pittock Mansion website for hours and admission fees. There are lots of photo ops at the International Rose Test Garden. The International Rose Test Garden is a place to test new rose varieties and is the oldest rose testing program in the United States, dating back to 1919. During rose season the International Rose Test Garden is a riot of colors filled with roses varying in shape, size, and fullness. The gardens are another favorite for photographers and are also dog friendly. Henry and Charlie taking a break from hiking through the Hoyt Arboretum. Not far from the International Rose Test Garden is the Hoyt Arboretum. The arboretum was founded in 1928 and is 187 acres of 2,068 species of trees from around the world with 12 miles of hiking trails. The arboretum is divided into different tree types and visitors can link together however many trails they wish to provide a nice hike and a visit to trees that interest them. All trails through the Hoyt Arboretum are dog friendly. South Park Blocks in the middle of the city. For beautiful park surroundings in the middle of downtown Portland, visit South Park Blocks. South Park Blocks is over eight acres, extends the length of 11 city blocks, and is perfect for relaxing or taking the dogs out to stretch their legs before leaving them behind to explore Portland. We visited South Park Blocks during our Best of Portland Walking Tour, which is also a dog friendly activity. South Park Blocks was designated for public park space in 1852 by Daniel H. Lownsdale and the first landscaping began in 1877. The vision was for South Park Blocks to be a cathedral of trees. Stone walkways with park benches run the length of the park on either side of green dotted with statues. Statues have been added to the park throughout time and include statues of Theodore Roosevelt and Abraham Lincoln. The Shemanski Fountain even has three low drinking basins for dogs. While Portland does have its museums, travelers to Portland are many times most interested in visiting Portland’s restaurants, breweries, neighborhoods and outdoor spaces. These five outdoor attractions will be appealing to all visitors to Portland, but even more so to travelers looking for dog friendly attractions to enjoy with their four-legged travel companions. Do you ever travel with your pets? Where have they traveled?